Cockleburs are a herbaceous annual found in the U.S. along the shores of streams and ponds and in low-lying areas of farm fields. 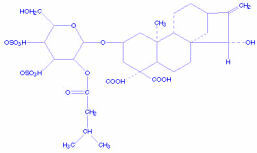 In its seedling stage it contains a hyperglycemic glycoside named carboxyatractyloside that can be deadly to livestock. Cockleburs tend to grow in areas that are waterlogged much of the year, but dry during the summer. They have a fruit capsule containing two seeds. Only one seed germinates the first year. Germination is delayed in the second seed until the following year. Cocklebur seedlings are high in carboxyatractyloside until the emergence of their first true leaves after which toxicity is lost. Carboxyatractyloside is a plant growth inhibitor. It has been hypothesized that carboxyatractyloside functions in a germinating cocklebur seed to keep the other seed in the fruit capsule dormant the same year. Carboxyatractyloside causes hypoglycemia in animals that consume it probably because it causes uncoupling of oxidative phosphorylation. Experimentally, phenylbutazone (BUTE) has been shown to reduce its toxicity by inducing synthesis of a non-cytochrome P450-dependent detoxification enzyme. Prior to death, animal becomes severely hypoglycemic with blood glucose levels dropping to 16mg/100ml. Increased vascular permeability leads to gross lessions of the gall bladder and peritoneal cavity and to liver necrosis.